What can CEOs learn from Apple? When Fortune listed the “best business books in the last 75 years” as part of their 75th birthday celebration, there wasn’t one book on marketing in their list. One wonders whether this was an oversight on the part of Fortune or a comment on the value CEOs place on marketing as a strategic tool for winning the battle for the customer’s mind. Recently, LinkedIn featured an online discussion as to whether Steve Jobs understands basic strategic planning principles. The consensus of the majority of respondents (of which there were many) is that Apple has an uncanny ability to create devices that customers did not realize they needed, but then suddenly can’t live without. This unique customer-focused sensitivity surpasses even the imagination of the most engaged innovators and early adopters with such speed that it obsoletes the concept of strategic planning. This has been demonstrated with the i suite of products, the i store apps, and the i retail stores loaded with i-heads and genius bars. It’s obvious that Steve Jobs has a clearer vision of the shape of the technology product marketplace than any other CEO serving the consumer. Judging from the enthusiastic marketplace response, he has proven that he is far more adept at crafting “cool” product designs with new functionalities that excite customers. While many CEOs are waiting and watching for their competitors to introduce something neat and new, and then emulating their new stuff, Apple does not hesitate to modify and refresh products based upon customer feedback, oblivious to what competitors are doing. This is the “first mover” marketing strategy at its best. Apple/Jobs has an inherent talent for this concept and does not hesitate to upgrade and even supersede existing designs with newer, better ones. Look at the success of the cool design of the Apple retail stores. Apple has succeeded in the retail space, where their competitors have failed, with the same slick attention to design detail and valuable customer service. Management waits to copy the competition, while marketing creates something new and exciting. The comparisons between traditional management and marketing thinking are never more obvious than with Apple’s current experience. Management concentrates on the product. Marketing concentrates on the customer and the brand. Management wants to own the product. Marketing wants to own the customer. Obviously, Apple has created an “ecosystem” that customers can trust. Management targets the center of the market where there is the most competition and lowest margins, while marketing concentrates on the “sweet spots” where there is little or no competition and where margins are higher. The most important marketing lesson in all of this is that while management is preoccupied with the short term—this month’s, this quarter’s results—marketing is focused on the long term, building the brand and cementing the position in the customer’s mind. Marketing is about developing an emotional bond with the brand. I love my i ______ ! While the world is focused on “e”-commerce, Apple has introduced the “i”—cool new devices to make the total e experience more rewarding and easier to access for consumers. Â Bob Donnelly, is CEO of VAAS Americas, the U.S. unit of the Chennai, India based maker and distributor of industrial valves. A coach, educator, and advisor to founders/CEOs of growing firms, he is a serial entrepreneur, having started, grown and sold several technology based businesses. 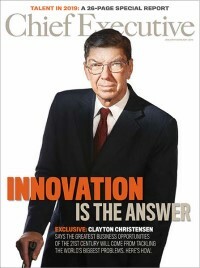 Earlier in his career he held senior management positions with IBM, Pfizer, and Exxon. He has developed an online MBA program in Entrepreneurship for Rushmore University with managers from global firms enrolled in the program. Since 1998 he has served as a venture mentor at New York University’s Stern School of Business Berkeley Center for Entrepreneurial Studies, where he advises start-ups on business plan development, marketing strategy, and presentation skills. He writes the online Entrepreneurial CEO column for Chief Executive.